International law often uses the term as if it were synonymous with state as in “United Nations” or ‘League of Nations’. The UN Charter includes a component of self-governance and ignores, within its definition of nation, concepts or units of non-self-governing groups of people. 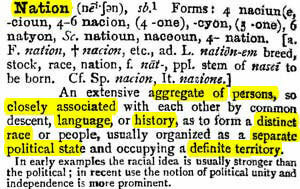 More recently, the international law has evolved away from the term nation as it was commonly known to represent separate countries on the world map (see old dictionary extract pictured). Concurrent with this development, North American Indians bands have enthusiastically adopted the word and commonly refer to themselves as “nations” in order to emphasize their independence; as in the Federation of Saskatchewan Indian Nations (at fsin.com) or Cherokee Nation (cherokee.org). This, even through they are usually completely enveloped within an existing state or country for the purposes of international law, and have no independent standing therein but at the same time relying on this concept to seek, from time to time, international status. In the result, and notwithstanding its prominence in inter-nation-al law, a contemporary definition of nation in international law has proven elusive. One dictionary (Osmanczyk’s “Encyclopedia of the UN and International Agreements”) refers to the word as “an international term having no international definition”, a rather circular proposition as the definition itself relies heavily on the term, as in “inter-nation-al law”!